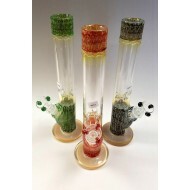 Mini Fumed beaker bottom tube by HVY glass. 18/14 glass on glass, 18/14 diffused down stem. Ice pinch 38 mm glass fumed beaker bottom , fumed top. Thick 14 mm funnel shaped bowl with ring around for easy grip.HVY glass logo etched on beaker neck. Downstem also has HVY logo imprinted on it.Large beaker bottom to house the smoke. Hits great! Easy to clean . Beaker shape borosilicate glass. Made in California! 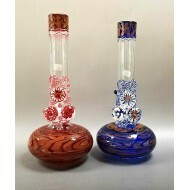 Hvy Glass is American made glass at affordable prices! 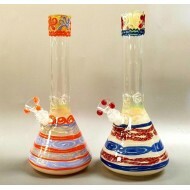 Docs is a proud retailer of HVY glass and we have been for years!! Quality and price!